Auroras Encore provided a 66/1 shock result to the 2013 John Smith’s Grand National when scoring for West Yorkshire handler Sue Smith and her husband Harvey, the former top international showjumper. Jockey Ryan Mania had a look of stunned disbelief in the press conference following his victory in the John Smith’s Grand National having won the world’s most famous steeplechase on his very first ride. Mania was riding for his boss Sue Smith, who also saddled Mr Moonshine, who was pulled up on the second circuit before the 27th fence. 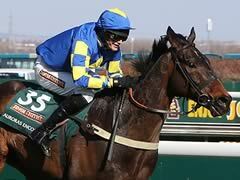 The 23-year-old jockey said: “I was always veering towards riding Auroras Encore. 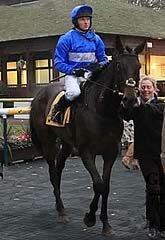 If the ground had gone soft I might have gone for Mr Moonshine as Auroras Encore really doesn’t like it soft. Mania, a former point-to-point rider from Galashiels in the Scottish Borders became the first Scottish-born winning rider of the Grand National since 1896, when Mr David Campbell (later General Sir David Campbell) won on The Soarer. 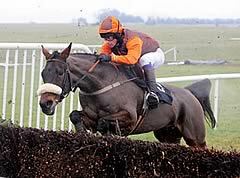 Mania’s victory marked a dramatic turnaround in his riding career, which was temporarily halted when he spent six months out of racing and working in hunt service after his former boss Howard Johnson lost his training licence. Cappa Bleu went two places better than 12 months ago for trainer Evan Williams and jockey Paul Moloney when beaten nine lengths in to second. Williams said: “We are getting closer! I was glad when the field kicked on as I knew we would stay but the winner has sprinted away. “I am pleased for Sue and Harvey Smith as they are proper, proper National Hunt people and to see old Harvey shedding a tear means everything. “It is great for the north and if we had to finish second, I could not have asked to finish second to better people. Moloney added: “The race went well and I got a lovely position. On the second circuit I was that confident that I made a move to the outside as I had so much horse beneath me and did not want to get brought down. “When I got to Valentines I really thought I could win but crossing the Melling Road I couldn’t go with them and I got caught flatfooted. To be fair he has galloped to the line but was one paced. “We could have done with a stronger pace from the start to make it more of a test but at the end of the day it is the National and they can’t go much faster. Both third Teaforthree and fourth Oscar Time were up with the leading pack through the majority of the 2013 John Smith’s Grand National and ended up rewarding their each-way backers with super clear rounds to take third and fourth place. 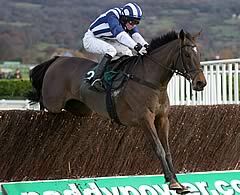 Teaforthree was facing the Aintree fences for the first time while Oscar Time had finished second to Ballabriggs in 2011.